COPPELL, Texas--(BUSINESS WIRE)--May 18, 2017-- Mannatech®, Incorporated (NASDAQ: MTEX), a global health and wellness company committed to transforming lives to make a better world, is observing National Police Week by donating a two month’s supply of its GlycoCafé™ nutrient-infused coffee to each member of the Coppell Police Department. Mannatech, headquartered in Coppell, has made community service a hallmark of its business, which includes supporting those who make great sacrifices to protect the public. 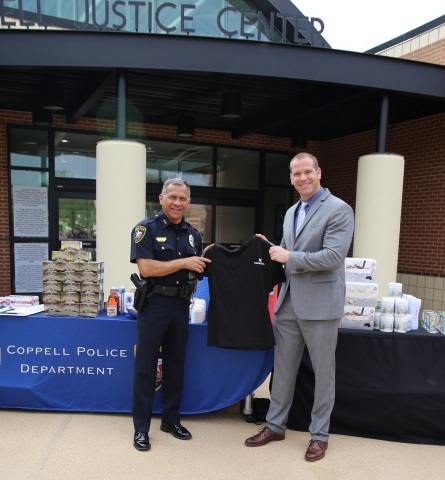 Mannatech made the donation to the Coppell Police Department today in a ceremony at the Coppell Justice Center. Each officer in the department received two boxes, or a 60-day supply, of GlycoCafé, a unique coffee made from the whole coffee fruit and infused with Glyconutrients, which is the core of Mannatech’s clinically tested nutritional technology. Each serving of GlycoCafé comes in a handy slimstick, and is delicious when mixed in hot or cold water. The convenience and energy boost GlycoCafé provides is perfect for police officers or any busy working professionals who want to enjoy a great tasting coffee anywhere at any time. Additionally, while most coffees on the market today only use roasted coffee beans, Mannatech’s GlycoCafé coffee is crafted using a blend of organic Arabica beans, antioxidant-rich coffee fruit and metabolism-boosting green coffee. Not only is GlycoCafé a complete coffee, it can also improve cognitive function, provide superior antioxidant support and support cardiovascular health. * Furthermore, GlycoCafé is vegan friendly and free of gluten, soy, dairy, MSG, sweeteners and artificial flavors and colors.